He envisaged a return to India's ancient traditions of "non-violence as the topmost dharma", "all spiritual paths being treated equally", "service to the poor" and "treating women like Goddesses".Agree with that. He better make the last piece happen in Delhi, Haryana, Rajasthan, etc. He promised to fulfil the dreams of his seniors in the BJP: former prime minister Atal Bihari Vajpayee's favourite project of interlinking rivers. tough call. this is where his organizational skills will actually be tested. Also, party patriarch L K Advani's pet project of bringing back the country's black money stashed abroad. "If need be, we will amend the law and also set up a task force for bringing back the money," the Gujarat Chief Minister said, adding that the money would be used for the welfare of the poor.This has Baba Ramdev's stamp all over it. Good idea, but there are Swiss secrecy laws. He said dignity of women should be a social responsibility and promised to launch a drive "Beti Bachao" against femicide. He said "if we view women not as a homemaker but as an equal partner and a nation builder, the country will progress in leaps and bounds". Good call But please do not forget this. He promised 100 smart cities across the country and said "urbanisation should not be seen as a challenge but as an opportunity". AgreeHe also suggested the idea of developing the twin-city concept like that in the developed world, calling for more satellite cities in the country. You already have twin cities in India. Hyderabad-Secunderabad, Ayodya-Faizabad and Dhanbad- Wasseypur. The Gujarat Chief Minister promised "equal development" for the North-Eastern states to help strengthen the nation and said "regional aspirations should not be considered as politics, as seen in the last decade, but should be seen as harbingers of development". same here. PS - I had put too many simelys. so had to remove some of them. for my pst to get through. BJP Manifesto talked about many things but mofo paid media is only talking about Ram Mandir. 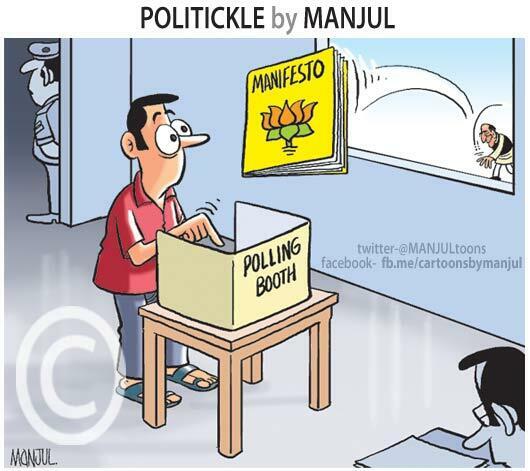 some more about BJP manifesto.. and the waves it created. Modi ne Nitish ki keh ke le li..
Bihar chief minister Nitish Kumar had been demanding special status for his state and had promised to support whichever party which comes to power at the Centre grants Bihar a special status. BJP prime ministerial candidate Narendra Modi has put him in a quandary after he announced in a rally in Bihar that if the NDA comes to power at the Centre he would consider giving Bihar either a special package or special status. Going by Nitish Kumar's words, he should then support the NDA if it grants special status. Going by Nitish Kumar's words, he should then support the NDA if it grants special status and Sharad Yadav is made a Union minister or better Nitish Kimar himself. So, here are the highlights from the actual manifesto. Many were actually there in Modi's vision document. I have actually put in green, the points which to me make the most sense and are not to difficult to achieve. Plus a couple of comments in blue. # The party reiterates its stand to explore all possibilities within framework of Constitution to facilitate construction of the Ram Temple in Ayodhya. # Reiterating its stand on Article 370 and discussing with all stakeholders for abrogation of the Article. # Ensuring minimisation of black money and setting up of a task force for this purpose. # Putting in place strict measures and special courts to stop hoarding and black marketing. # Setting up a Price Stabilisation Fund. # Unbundling FCI operations into procurement, storage and distribution for greater efficiency. # Evolving a single National Agriculture Market. # Promoting and support area specific crops and vegetables linked to food habits of the people. # Developing high impact domains like labour intensive manufacturing, tourism, and strengthening traditional employment bases of agriculture and allied industry. # Harnessing opportunities provided by the upgradation of infrastructure and housing. # Encouraging and empowering youth for self employment and transforming employment exchanges into career centres. # Eliminating corruption through public awareness, e-governance, rationalisation and simplification of tax regime. # Harmonising Centre-state relations by evolving model of national development driven by the states. # Setting up a Team India initiative which will include the PM and CMs as equal partners. # Ensure fiscal autonomy of states and creation of regional councils of states of common problems and concerns. # National Development Council and Inter-state Council will be revived and made into active body. # Involving state governments in promotion of foreign trade and commerce. # Greater decentralisation through smaller states. # Special emphasis on improving connectivity in Northeast region. # Massive infrastructure development in NE region. # Complete all pending fencing work along the India-Bangladesh and India-Myanmar border. # Dealing with insurgency with a firm hand. #BJP to draft a Uniform Civil Code drawing upon the best traditions and harmonising them with the modern times. # Foreign policy will be guided through pragmatism and doctrines of mutually beneficial and interlocking relationships. # Launching a massive Clean Rivers Programme with people’s participation. # Pursuing friendly relations with neighbours and at the same time not hesitate from taking strong stand when required. # Reviving the anti-terror mechanism which has been dismantled by the Congress and putting in place swift and fair trial of terror-related cases. # Insulate intelligence agencies from political intervention and interference. # Strengthening DRDO and encourage private sector participation including FDI in selected defence industries. # Strengthening physical infrastructure with expediting work on freight and industrial corridors. # Setting up of gas grids and national optical fibre network upto the village level. # Launching of diamond quadrilateral project of high-speed rail network (Bullet trains). # Setting up of agri rail network catering to needs of perishable farm products. # Universalisation of secondary school education and skill development and establishment of national e-library. # Implementation of national education policy.UGC to be restructured and transformed into higher education commission. # Pursuing an agenda of equal and rapid development of all three regions of Jammu and Kashmir – Jammu, Kashmir and Ladakh. # Return of Kashmiri Pandits to the land of their ancestors with full dignity and security. # Evolving further the PPP model into a People-Public-Private Partnership (PPPP). # Strengthening self-governance and empowering Panchayati Raj institutions with a devolution of functionaries and funds. # Consolidating Gram Sabha institutions, involving people, in policy formation. I have some inside news that the manifesto document was readied by a 20 year old guy from Harvard. And that BJP intentionally delayed the release of manifesto to have the last word. I see quite a bit of Farming and agriculture too in there. "The opposition to caste-based reservations is now dressed up as a turning away from identity politics and tokenism"
Actually, i did not find this anywhere and Ages back (like in 2007), i was responding to Shakti Pai that "BJP is comitted to Social Justice" as per Prakash Jawdekar. Now, this trining away from identity politics would be a welcome change. What is absolutely amazing, and for this I denounce BJP as well .. is the complete absence of the issue of "population crisis" altogether from the agenda, manifesto, discussion ..
Sure enough, its not an easy issue to handle during polls, but somebody has got to think about it and bring it up. Ok, by the same token, please ban all the modi jerk-offs too. Saala nothing but one topic. And mostly copy/paste. Havent seen this much mass masturbation over an old fucker since SRK premiered his six-pack-abs. Melly Anna Bhadak gaya hi and you want to rep me ? then Melly can stop visiting Modi threads. He anyway comes here once in a while. What else is being discussed on this forum site anyway? Election season me mostly politics his discuss hoga. Happy to see how the BJP has a sane and reasonable manifesto. If Modi manage to fulfill just a quarter of these promises, India will go a long way. To fulfill all of these promises, Modi and the BJP must be given repeated terms as PM. The fiasco that was 2004 and 2009 with Congress coming to power must never be repeated again. Congress hatao aur Desh bachao. Bharat karega haar mushkiloon ka paar.